2013’s highest caliber, most fun blockbuster releases to all frontiers today. 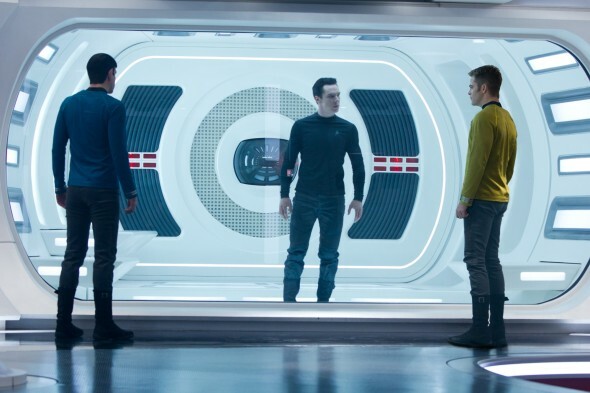 Star Trek Into Darkness – JJ Abrams’s exceptional sequel to his surprisingly awesome Star Trek reboot – brings all the humor, spectacle, nerdiness and octane of its predecessor. In fact, it may top it, thanks in part to the director’s genuine affection for the source material, his genius for casting, and his ability to tell a story that’s as pleasantly familiar as it is excitingly surprising. Speaking of source material, why not get set for the legendary William Shatner’s visit to Columbus next weekend and revisit 1982’s Star Trek II: The Wrath of Khan? Beyond Ricardo Montalban’s heaving chest plate and the wolverine napping on Shatner’s head lies a solid trek less dependent on special effects than basic storytelling. You’ll find various elements from Into Darkness began with STII, and though too many trekkies got their phasers stunned by the liberties Abrams put to use, the two films can co-exist just fine.